PHOENIX, Ariz. (Reuters) - For most of this year, Democratic U.S. Senate candidate Kyrsten Sinema of Arizona has run what has been viewed widely as one of the best races in the nation. But with less than a month to go to Election Day, there are doubts whether she can make it across the finish line. Since the furious battle over the Oct. 6 confirmation of Supreme Court Justice Brett Kavanaugh, the national picture seems to have shifted. Republicans have taken an upper hand in states such as Tennessee and Texas - and have stayed competitive in places like Florida and Indiana. That makes Arizona and neighboring Nevada the best hopes for Democrats to flip seats held by Republicans. Democrats have a better chance to assume control of the House of Representatives, where they need 23 seats to become the majority. Should they take either chamber, much of Trump's agenda would be thwarted and his administration would be subject to greater oversight. The odds, however, have always been against Sinema, a member of the House who is seeking to replace retiring Republican Jeff Flake. Arizona has long been a right-leaning state, one that has come, in a sense, to embody the divisive politics of President Donald Trump. This is the "build that wall" state. The state of anti-immigrant former Sheriff Joe Arpaio, where Flake was basically driven from office because of his criticism of Trump. It has not elected a Democrat to the Senate in 30 years. But Sinema surprised observers by building an early advantage in the race. She had little competition for her party's nomination and built a steady edge over McSally, also a member of the House, who had to stave off two challengers, including Arpaio. Sinema has billed herself as an independent voice while courting the moderates she needs to win, even as some left-wing progressives have groused that she has been too cautious. She stayed quiet for much of the Kavanaugh fight, only opposing his confirmation at the very end. She has backed the efforts of the U.S. Immigration and Customs Enforcement agency, amid calls from some in her party for its abolishment. Asked last week about supporting "Medicare For All," a universal healthcare policy favored by many Democrats this election season, she said she wants more practical solutions. Much was made locally about Sinema's choice to not endorse the Democratic candidate for Arizona governor, David Garcia, a progressive. She has not appeared at events with Garcia and other members of the Arizona congressional delegation. Her centrist approach, however, won over Steve Jensen, 63, a disabled veteran and longtime Republican who attended a Sinema event in central Phoenix last week. Jensen said he had come to disdain the "politics by fear" on the Republican side and did not like that McSally increasingly seemed to be aligning herself with the president. "Most of McSally's votes to me seem to be going along with Trump," Jensen said. Sinema's candidacy stands in marked contrast to that of Representative Beto O'Rourke in conservative Texas, the Democrat who is running against incumbent Republican Senator Ted Cruz unabashedly as a left-wing progressive. Sinema seems now to be in a better position than O'Rourke to win her race while receiving much less national attention. "She has run the best Democratic campaign that I have seen here for a long time," said Chad Campbell, a Phoenix-based Democratic strategist. That has made her a top target of well-funded conservative advocacy groups who have bombarded the airwaves in an attempt to stop Sinema and boost McSally. Campbell conceded that the ads "have chipped away at her lead." Many of the ads have a common theme: Sinema has misrepresented herself; she is a stealth liberal disguising herself as a moderate. Sinema began her political career in Arizona as a member of the Green Party, but joined a moderate Democratic caucus when elected to the House in 2012. "She's trying to go right, right, right," former Arizona Governor Jan Brewer, a Republican, told a Phoenix radio station last week. "She's still a liberal." McSally, a former Air Force fighter pilot, has run multiple ads showing Sinema protesting the Iraq War while dressed in a pink tutu. One conservative group, Defend Arizona, sent out an anti-Sinema mailer last week that depicted a mushroom cloud over Phoenix. "It's clear she's engaged in desperate and ugly behavior," Sinema said after a campaign event last week. A national Republican source told Reuters that the party believes the attacks on Sinema's image are effective and will persist through the rest of the campaign. 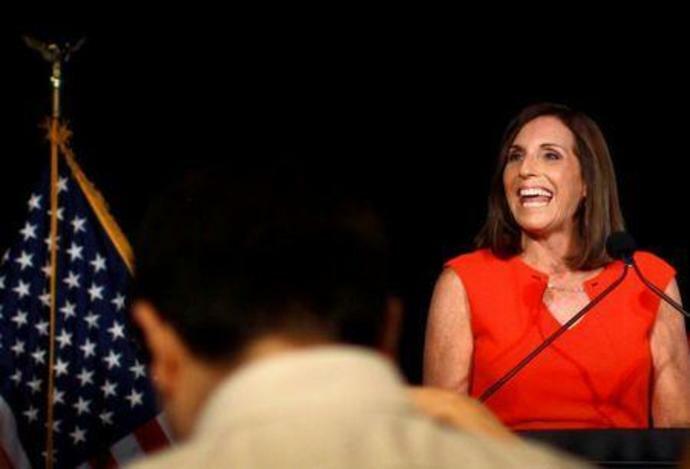 McSally's campaign has turned to high-powered surrogates for help. On Friday, former Republican presidential nominee Mitt Romney, a candidate for the Senate from Utah, appeared with her at a rally in the town of Gilbert. Trump will hold a campaign event this Friday for McSally in Mesa, a Phoenix suburb. "We are literally in a dead heat right now for this Senate seat and this Senate majority," McSally told the crowd while blasting Sinema as unpatriotic. Tim Bushnell, 60, of Fountain Hills, Arizona, who attended the rally, said he could not vote for Sinema. "Her history is pretty radical-left," he said. Sinema's campaign believes she can weather the attacks because she spent money early in the race on ads defining herself to voters while Republicans were still fighting among themselves. She is still raising money, taking in $7 million in the third quarter. If Sinema prevails, she will be able to argue that her moderate strategy may be the best way for Democrats to defeat Donald Trump in 2020. If she loses, any hope her party has of taking the Senate likely will fade with her.